Meat consumption, or overconsumption, rather, in the United States is at a record high. The demand for meat in our market is at a level that's unsustainable, and the myriad of effects this has on our world is threatening. The United States Department of Agriculture reports that men in this country eat 170% of the recommended daily allowance (RDA) or meat. Women similarly eat 135% above what's suggested. The saturated fat takes a toll on our health. The dollars spent on meat production takes a toll on our budget. The energy required to produce and then ship the meat takes a toll on our environment. It would make sense, then, that even reducing the amount of meat we eat one day of the week reduces some of this social, economic, physical, and environmental strain. The folks who launched the Meatless Monday campaign have spread this important message and encouraged Americans to incorporate just one meat-free meal per week. 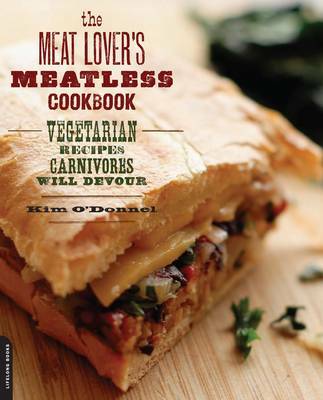 Kim O'Donnel's The Meat Lover's Meatless Cookbook: Vegetarian Recipes Carnivores Will Devour makes it easy to do so. In the cookbook, O'Donnel recognizes that one doesn't have to be vegetarian to eat and enjoy a vegetarian meal. She shows carnivores and herbivores that there exists a world of meatless meals that are healthy, mouth-watering, hearty, and fuss-free. In The Meat Lover's Meatless Cookbook, O'Donnel groups menus by season, and each season holds twelve delicious meals that span from gluten-free to vegan. There are tips, helpful hints, and techniques that allow cooks of all backgrounds and skill levels to enjoy the wholesome dishes. The fall menu alone includes recipes for Ratatouille, Coconut Rice, and Baked Stuffed Shells with Lentil Ragout and Spinach. O'Donnel shares her passion for variety and for food exploration. A meat-eater herself, she recognizes the beauty and innovation of what she's created within the pages of this cookbook. She says, "There are many great all-purpose cookbooks that speak directly to vegetarian and vegan home cooks, newbies and veterans alike. What I'm presenting is a meatless collection created by a meat lover expressly for meat lovers. It's meatless but not vegetarian; instead it's celebrating meat in moderation and dietary diversity." That sounds awesome! I actually have the opposite problem. I don't eat enough meat. But still, this is a great idea and judging by the photo on the cover, I'm sure everything's delicious! This is a very short video about a competition in America to eat 72 ounces of steak in a certain time. I'm not really sure why they chose the number 72 and I'm really not suggesting that you should do it but it's funny what types of things happen in the world! I myself am planning to do it but I will let you know what happens.